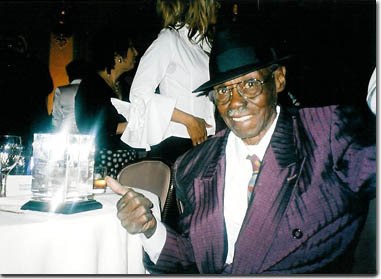 In 2005 Bob was part of the Pinetop Perkins entourage that also included Ike Turner, Kim Wilson, Paul Oscher, Elvin Bishop and Mark Carpentieri (MC Records). How wonderful it was to witness Pinetop being rightfully honored with his lifetime achievement award! Special thanks to Pinetop’s manager Pat Morgan for all her hard work and caring. Pinetop Perkins and Charlie Musselwhite. Bob Corritore and Ike Turner. Bob Corritore with Pinetop Perkins. Mark Carpentieri, Patricia Morgan, Bob Corritore celebrating Pinetop Perkins. Don Cornelius of Soul Train and Kim Wilson. Photo Bob Corritore.